Tanggal : 09/23/2013, 10:10:58, dibaca 1139 kali. 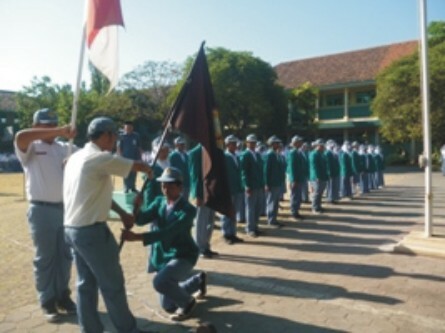 Bertepatan dengan Upacara Bendera Peringatan hari Lalu Lintas di SMA Negeri 5 Surakarta, Juga di adakan pelantikan pengurus OSIS baru periode 2013/2014. Pelantikan dilakukan langsung oleh Kepala Sekolah Bapak Sajidan, S.Pd., M.Pd. untuk periode 2013/2014 OSIS diketuai oleh Muklis dari kelas X MIPA 2. What i do not understood is in fact how you're no longer actually much more neatly-liked than you might be right now. You are very intelligent. You realize thus considerably in the case of this subject, produced me for my part believe it from so many varied angles. Its like men and women aren't involved until it something to accomplish with Woman gaga! Your own stuffs nice. At all times handle it up! Hi, Neat post. There's an issue together with your site in web explorer, would check this?IE still is the market leader and a good part of people will omit your fantastic writing because of this problem.